ROAD TOWN, Tortola, VI – Territorial At-Large Representative and political back bencher within the Natational Democratic Party (NDP), Hon. Archibald C. Christian slammed a local online news site yesterday, April 8, 2013 for what he termed ‘a breach of ethics’. The Territorial Representative was at the time speaking during the Other Business segment on day two of the seventh sitting of the second session of the second House of Assembly (HOA) and referred directly to BVI Platinum News in his remarks. “The press has an important function in any society and I would never advocate barring or banning the press from doing what is right and legally and ethically right in a country, which includes the Virgin Islands,” Hon. Christian said. The first-term Territorial Rep then referred to an established protocol within the HOA regarding the treatment of reports. “We have a protocol that whenever items are going to be laid in this Honourable House, that the Members get that information, and before that information is made public, there is a process,” Hon. Christian stated. Hon. Christian alluded to the article containing leaked information but did not offer any suggestions about where the leak may have come from; instead, he called for an investigation into the news site’s publication of the article while noting that someone should be held accountable. “…therein lies my problem with the press, because Madam Speaker, if any Member did not digest or read that report in its entirety, and then you had constituents calling you about a report, you were in a quandary, because… what are you talking about?” he asked. Hon. Christian stated that he believed "that the press knows the rules” regarding HOA protocol and the publication of documents. Hon. Christian felt the press provided a valuable source of information to the country but suggested the press ought to know when to print and release stories on matters concerning the HOA. While Virgin Islands News Online received the Treasury Forensic Examination Report around the same time members got it, we respect the parliamentary process and the newsroom had decided to wait until it becomes a public document before reporting on its contents. HOA is elected by the people!!!! They have a right to know!!!! i agree 10000% what the fuss all about...those NDP-Boys so full of themselves??? I TOTALLY AGREE! 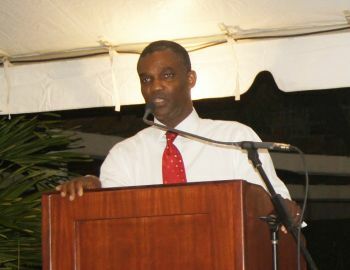 BVI Platinum started off nicely being fair and impartial, now they have become the very thing they once criticized. sad truly sad. everytime you go on their site they tryng to hit at the VIP and make the NDP look good. I like their lable pro-government...i mean SERIOUSLY? this is level of journalism in the BVI?? no no no…’tis a sad day indeed. SHAME ON BVI PLATINUM NEWS! Be quiet Archibald what do you have to hide, govt is a necessary evil that should always have watchful eyes placed steadfast on it. Have you not gauge the temperature of the VI, mixed feeling about independence, and support for the press. Its not because of love/hate, but a total distrust of people in politics. So NDP stop bitching about the press if you don't have anything to hide, and get on with doing right by the people of the VI. Believe if members of a govt is found responsible for the destruction of its people/country those member and their family should be exile, $h1t maybe worse. You sound so STUPID!! what is wrong with you people. Are we so blinded by share ignorance. What the HELL is this government hiding? Tell me somebody..As far as I can see, this government is clear on every project that has been proposed. You know, I often get mad when I hear people talking about England taking over but for how stupid some of you sound, sometimes I wish they would then you all would understand what destruction of people and country is. I never heard more nonsense talk in my life...some of our people really dont like to read and udnerstand truth. Yore ARE truly blinded by "share" ignorance.......but the amount of sheer ignorance is obviously absolute! This guy is the biggest dweeb & hypocrit that BVI politics have ever seen. It is increasingly apparent to all who read the online news that BVI Platinum functions as the mouthpiece for the NDP government, therefore not a legitimate member of the press. More like a Government gazette. The thing is Platinum trying to keep up with VINO rushing to put out story see what is cost them…tek your time VINO you will always be number 1…. It is very clear that platinum is deliberately bias. Platinum seems to bias aginst the VIP by doing poor journalism by publishing spotty stories directed against the VIP. They DON’T tell the whole picture only part of it to stirr up confusion. neither party smells like a rose. but I applaud any news organization that covers any story and brings it to the public. yes, it would be nice for everything to be totally factual. But if Mr. Christian truly expects the house to be respected as the law of the land, then the house has to respect the people of the land and not abuse the law or their positions. he expects respect. but legislators don't respect their constituency. AND FORGET ABOUT BREACH OF ETHICS. And if the public reads something before the legislator, too bad. the word should be available sooner or later, and it is up to the legislator his due dilligence to read documents!!! news outlets should be holding government accountable. Indeed, I wish there was more investigative reporting brought to light-- like members of the Tortola Pier Park group, who is getting paid off, where is the environmental impact report for the airport? is there a new design for the west end ferry or even pier park cruise ship dock? And public meeting HAVE TO MEAN SOMETHING other than just reporting what has already been agreed upon. pay attention people. We are in the driver's seat.